This is regarded as the largest of all treeferns, though in cultivation its dimensions may be exceeded by other species such as C. medullaris, particularly in a cooler climate. A very robust, beautiful species, closely related to C. cooperi but far more spectacular in size and appearnace. It is not very common in cultivation outside of Australia. 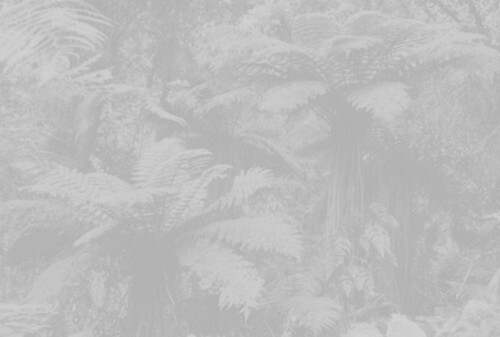 The fronds can reach up to 20' long and are held in a most attactive habit, and the trunk, which is quite thick under humid conditions, can in the wild reach an incredible height of 100'! As the fern ages, the trunk appears to look more woody and may also show some taper. Although it comes from a completely frost free environment, it will tolerate nearly as much frost as C. cooperi, and is also very fast-growing (especially as a young plant) and easy to cultivate, responding to large quantities of fertilizer. The uncurling croziers are covered in beautiful large, pale brown scales and small, dark brown scales. 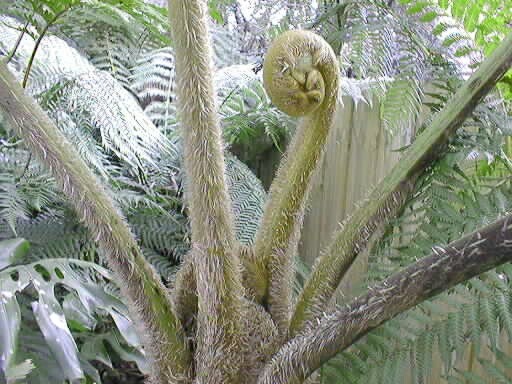 The fronds are hardy to about 27°F, and it is well worth overwintering in a zone 8b climate with copious amounts of house insulation, although it will eventually outgrow practical protection measures. It will perform well in partial sun in most climates where it is hardy (full sun advised in cool maritime climates), and its fast growth enables it to recover from damage quickly. Very easily raised from spore. 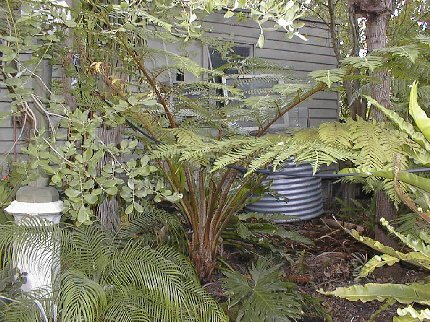 Vigorous young plant of Cyathea brownii. Photo courteousy of Scott Ridges. 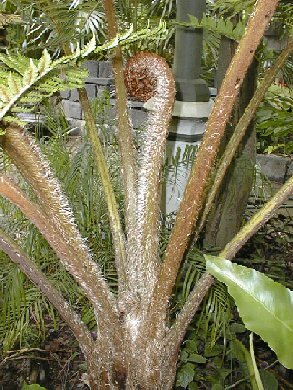 Uncurling crozier of Cyathea brownii covered with attractive light brown scales. On older plants a large number of croziers expands at once, making for quite an imposing sight. Photo courtesy of Scott Ridges. 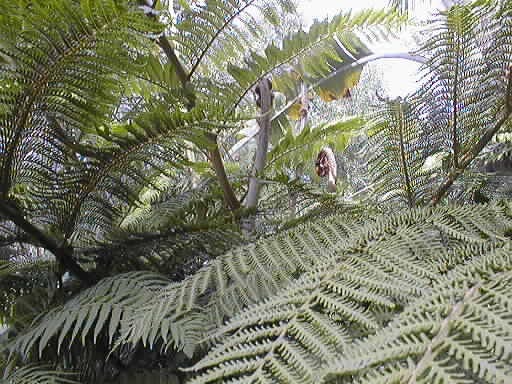 Another nice picture of the crown of Cyathea brownii. Photo courtesy of Scott Ridges. 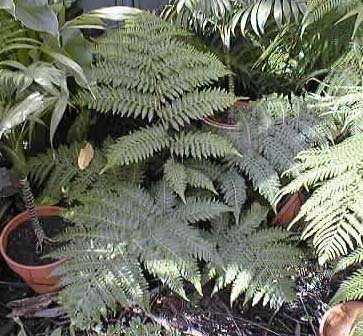 Croziers and fronds of Cyathea brownii. Photo courtesy of Scott Ridges. A young Cyathea brownii. Photo courtesy of Scott Ridges.